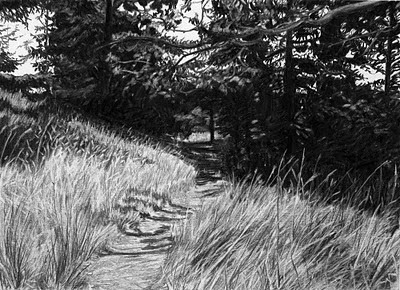 My drawings reflect a need to escape the hectic pace of city life and to make time for contemplation of the natural world. I tend to wander off the trail, seeking out the verges of parks, forests, riversides and beaches to find areas that interest me. My compositions are devoid of intrusive figures, enticing the viewer in, offering a quiet space for escape, detachment from the mundane world, and suspension from the passage of time. I am always available for commissions if you like the look of something here, but want a more personal view depicted. Contact me for a discussion. Work on this site is for sale unless otherwise specified. I have been an active member of SLWA since June 2008. I have participated in many group shows, curating and hanging several. I assisted in the production of a series of Professional Development talks for members, and have also organised and directed a number of critiques. All work copyright © Liz Charsley-Jory. No reproductions without permission. . Powered by Blogger.